Heading to Nashville and looking for the perfect itinerary and things to do? Last month I was lucky enough to visit Nashville in partnership with the Grand Ole Opry and had an absolutely wonderful time! Nashville, as I’m sure you know, has been blowing up in popularity. I think my Lyft driver said that everyday 100 people move to the city which is just crazy. And if you aren’t moving there then you likely have plans to visit, and with that you’re likely wondering what to do. In a city like Nashville there are countless options which can make it hard to narrow down your to do Nashville itinerary. So of all the things I saw, did, ate, and drank while visiting - here is my list of the 8 things you absolutely cannot miss! 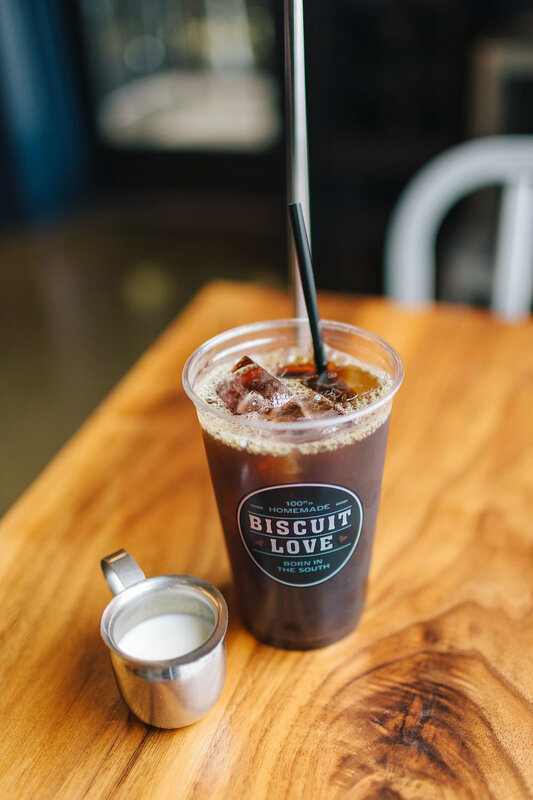 Biscuit Love is a restaurant serving breakfast and lunch (and biscuits!) and it is a hit! So much so that people wait hours at times to get a chance to try this Nashville hot spot. 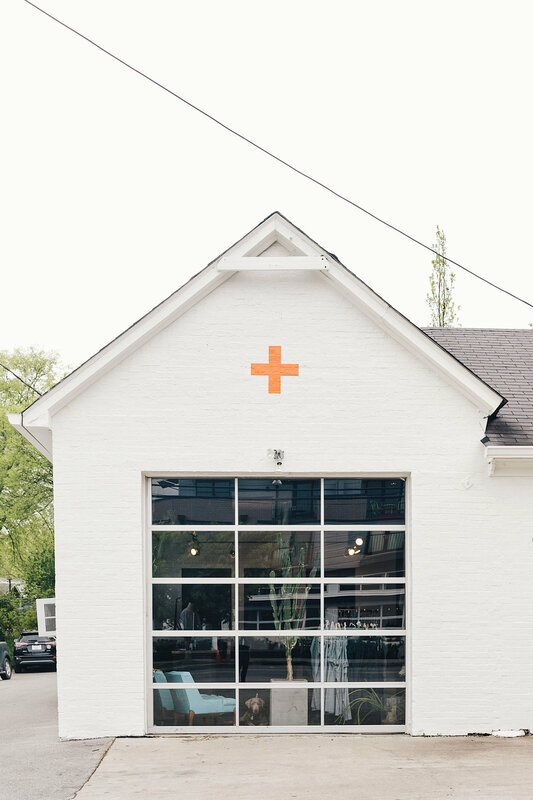 It started originally as an airstream food truck (swoon) and has since moved on to have two popular Nashville locations with a third in Franklin. The Gulch location in Nashville is the original brick and mortar and the more popular of the two in the city. Luckily my friend Kristin, a Nashville local, recommended I check out the Hillsboro Village location instead and I am so glad I did! There was no wait, it was delicious, and Hillsboro Village (above) is a great place full of boutiques, cafes, and more - perfect for exploring after your meal. I didn’t get a chance to try them, but I’m told the bonuts are a can’t-miss menu item. I ordered the “Princess” so that I could try a biscuit and some fried chicken and it was delicious (and a bit heavy, but you should know that going into it). I especially love that Biscuit Love is ran by a local husband and wife team, the food is 100% homemade, and they support local businesses as much as possible when sourcing ingredients. Don’t miss it when visiting and don’t forget your camera, of course! In addition to the photogenic food, the Gulch location has marquee letters spelling “Nashville” and the Hillsboro Village location spelling “Music City”. 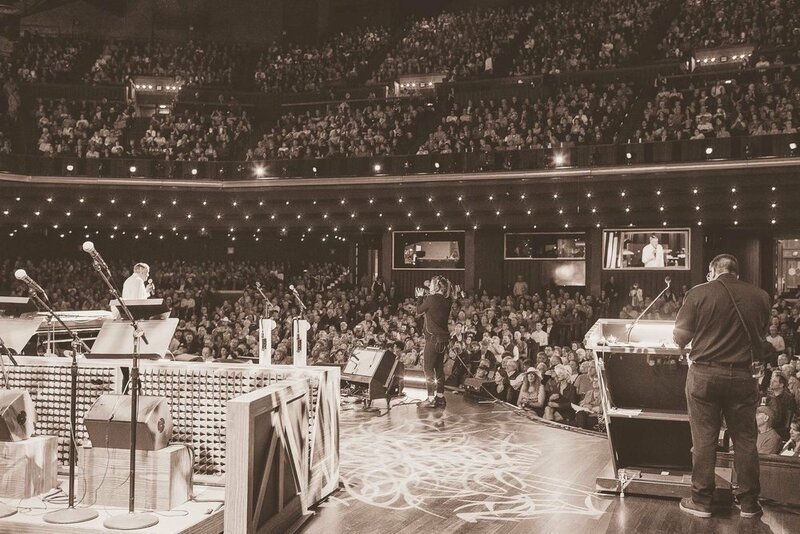 I cover this in great detail in my Guide to Visiting Nashville’s Iconic Grand Ole Opry but I’ll say it again - do NOT visit Nashville without visiting the Opry! No trip would be complete without it. I especially recommend the VIP backstage tour which allows you to privately check out the backstage area including the artist entrance, their dressing rooms, etc. You even get to stand on stage as the curtain goes up and stay there for the entire first performance - amazing! Acme Feed & Seed is a feed store turned restaurant-cocktail-entertainment space on Lower Broadway. 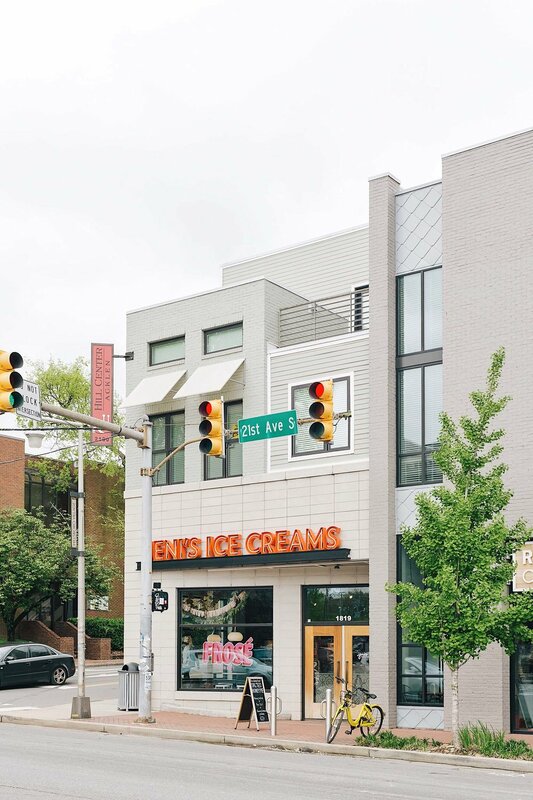 It has three floors plus an open-air rooftop overlooking all of downtown - something for everyone! The first floor is a honkytonk style restaurant with food and beer to be eaten on communal tables. At times you’ll find live music featuring local musicians here, too! There’s also a small Acme Farm Store on floor one. Floor two is home to a lounge and bar serving craft cocktails and beers and a large whisky/bourbon collection. There’s also a sushi bar if that sounds appealing! At the very top is an open-air rooftop which I am so bummed to have missed as I am told it is an awesome place to grab a cocktail or two. Nashville is known for its murals (translation: Instagram backdrops) and you'll find them just about everywhere! 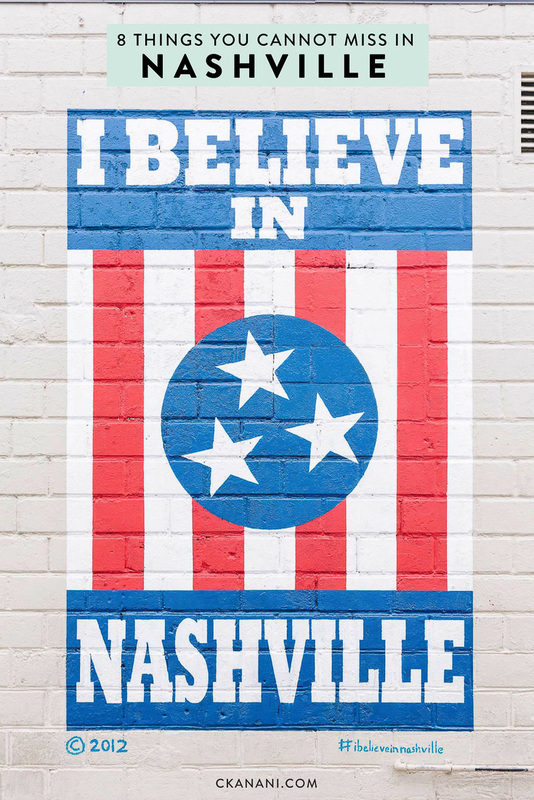 There are a few super iconic ones like the "I believe in Nashville" that you may want to specifically seek out, while others you may just randomly stumble upon while you're out exploring. Eat hot chicken, of course! Prior to visiting Nashville I had not even heard of hot chicken. In case you’re in the same boat, hot chicken is fried chicken that is spiced with cayenne pepper. It’s a local specialty in Nashville and something you absolutely cannot miss! I was running low on time so the only hot chicken I tried was at Biscuit Love but I am told by everyone (tourist friends, Lyft drivers, other local friends) that Hattie B’s is actually the place to go! There is often a line but apparently it is worth it. And you can’t go to Nashville without trying hot chicken so regardless of where you try it, just make sure you do! When I plan a trip the first thing I do is gather recommendations from friends, Pinterest, etc. and compile them into a big list. I then do further research on each place, narrowing it down to the best of the best, and then add each spot I want to go to Google Maps on my phone. When I did this for my Nashville trip I noticed a huge amount of things on my list all hovered around one location - a spot I later learned is called “12th South”. 12th South is a neighborhood, I guess, full of boutiques, coffee shops, murals, and even (on occasion) flower trucks! You can easily spend many hours checking out everything this area has to offer and my time spent here was some of my favorite of the trip. Frothy Monkey - this is a local coffeehouse chain and it is SO GOOD! If I had known it was going to be so good I probably would have stopped here every morning. Go for breakfast. I tried the “California”, the hummus with veggies, and a golden monkey with espresso. YUM! Imogene + Willie - a charming boutique in a 1950s service station. Amelia’s Flower Truck - if this flower truck doesn’t give you heart-eyes I don’t know what will! It is mobile so you’ll have to check it’s location but if you time it right you can catch it outside of Imogene + Willie. Draper James - Reese Witherspoon’s clothing boutique. Plus all of the above shown and mentioned murals are here! If you’ve been here before then you know I love to be outdoors as much as possible, that I love a good view, and that I love to catchup with friends over drinks in pretty spaces. The solution? Rooftop bars! In SF we don’t really have any so whenever I’m in a city that does I get more excited than the average rooftop bar visitor. 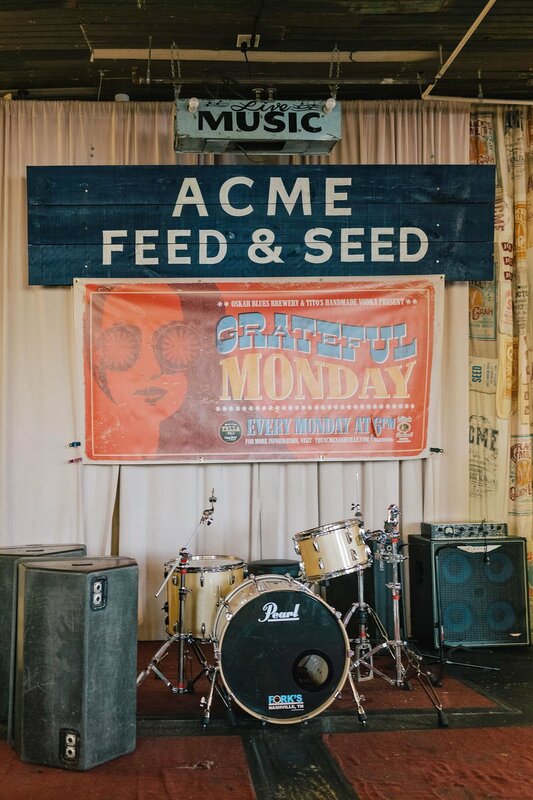 As mentioned above, Acme Feed & Seed has a popular rooftop bar which I unfortunately did not get to visit while in town. 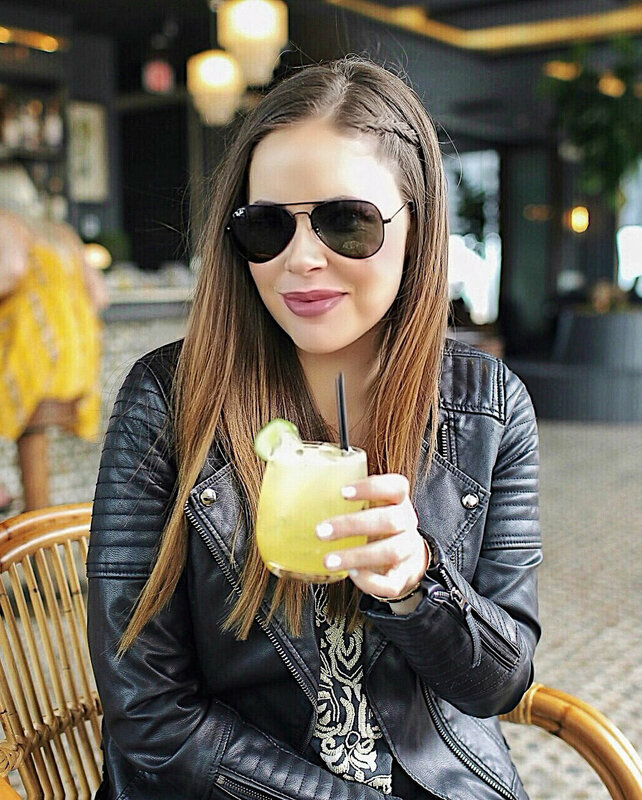 I did, however, get to enjoy drinks and some lite bites at the Westin’s L27 Rooftop Lounge which was incredibly lovely and somewhere I highly recommend checking out! If you want to have a unique and memorable meal - this is the spot! I will definitely be back for round two next time I'm in town. Plans in Tennessee outside of Nashville? Consider glamping with Llamas for a unique adventure! This post was done in partnership with the Grand Ole Opry. Everything above is my own opinion, as always!